As in Stellaris, your research options will be randomised for each game. Matt Damon made life on Mars seem almost trivial, but I have a sneaking suspicion that I'd struggle to adjust to the red planet, what with its notable absence of corner shops offering cheap flapjack at nearly any time of day. Haemimont Games' imminent Surviving Mars will give me a chance to prepare for it beforehand—you know, should NASA run out of astronauts and have to resort to sending unfit games journalists out on its galactic expeditions. 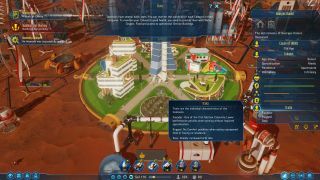 You've already seen Evan Lahti play Surviving Mars for 13 of our Earth minutes, but ahead of its release on March 15, developer Haemimont Games joined us at the PC Gamer Weekender to offer a little more detail about its open-ended city-building strategy game. Taking a cue from publisher Paradox's Stellaris, the technologies on offer on the research screen will be randomised for each playthrough, with only a third or even a quarter of the total tech being available to players on each run through the game. Hopefully this will keep it feeling fresh, by stopping players from falling back on the same strategies each time they start a new colony. The above is only a glimpse of the full panel with Haemimont Games, however. If you'd like to watch the developer talking us through the early parts of a Surviving Mars mission, then get your peepers round the whopping 45 minutes of Martian footage I've stashed below.